Glimpses of Home is a beautiful, inspiring book created as a family project. Paintings by daughter J'aime expressing the beauty that moves her, photographs by son Christopher who has the special gift of capturing images and moods on film, moving and inspiring stories by mother Lency, and poetic writings by father Chuck form a perfect synthesis which opens the heart and carries the reader with it into a world beyond the many problems, difficulties and obstacles that so often characterize our everyday life. Glimpses of Home was designed as a coffee table book to show to family and friends, or to be placed on the bedside table to be savored a little at a time. Its images show the beauty and diversity of life on earth, and its paintings touch and open in a joyful way. Words can be medicine, the perfect antidote to everything that ails us. In a world that has too often lost its heart, this book is meant to help the reader regain it. You can inspire another only by opening your own heart and sharing what inspires you. 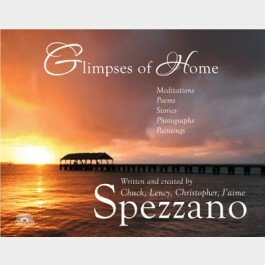 Glimpses of Home offers a fine insight into what inspires the Spezzano family, and should not be missing from the bookshelf of any reader wanting to be inspired.